A crowd in Victoria, British Columbia watch King George VI and his royal consort, Queen Elizabeth coming up the walkway during their 1939 royal tour of Canada. The first member of the royal family to visit Canada was the future King William IV, who arrived on the country's east coast in 1786 while an officer in the Royal Navy. His niece, Queen Victoria, never came to Canada, but during her reign her son, the future King Edward VII, made the first modern Canadian royal tour: partaking in official engagements, meeting politicians and the public, and reviewing troops. There had been many invitations since 1858 for the reigning monarch to tour Canada, but in 1939 King George VI was the first to do so. During that trip, the King's wife, Queen Elizabeth, initiated the tradition of the "royal walkabout", though her brother-in-law, the former King Edward VIII, had often met ordinary Canadian people in 1919; as he said: "Getting off the train to stretch my legs, I would start up conversations with farmers, section hands, miners, small town editors or newly arrived immigrants from Europe." Royal tours can take more than a year to organize. The planning is coordinated by the Canadian Secretary to the Queen. The regions to be visited are decided by a rotational formula. Modern tours have run with a theme; for instance the visit of Elizabeth II and the Duke of Edinburgh in 2010 was intended to highlight "the Canadian record of service—past, present and future"; themes are decided upon by the Queen's secretary together with the Minister of Canadian Heritage and the Office of the Prime Minister. HMS Pegasus in the harbour of St. John's, Newfoundland. Commanding Pegasus from 1786 to 1787, Prince William Henry was the first member of the Royal Family to visit Canada. As an officer in the Royal Navy, The Prince William Henry (later William IV) was the first member of the Royal Family to visit Newfoundland Colony, the colony of Nova Scotia, and the Province of Quebec (later Lower and Upper Canada). William's first visit to the colonies was during his command of HMS Pegasus, a command he was given on 10 April 1786. Arriving in Newfoundland, William found himself involved in the civil and naval affairs of Newfoundland, with no permanent civil authorities, and the newly arrived Prince being the senior naval officer in the colony. During his time in Newfoundland, he presided over a court, and commissioned the construction of St. Luke’s Anglican Church in New-Wes-Valley. On 21 August 1786, he celebrated his 21st birthday on his ship in the waters off Newfoundland. He eventually proceeded to the main base of the Royal Navy's North American Station, based at the Royal Naval Dockyards in Halifax, Nova Scotia. Although he received a royal reception upon his arrival to Halifax, it was later made clear he would receive no further special treatment, not already accorded to an officer of his rank in the Royal Navy. William visited the Quebec in 1787, travelling as far inland as Cornwall. While there, he encouraged the United Empire Loyalists to settle the region that later made up Upper Canada. Near Cornwall, he also received a reception from members of the First Nations communities. Following his visit to Quebec, William was stationed in the West Indies. Depressed over the departure of Horatio Nelson, who he befriended during his time in the Caribbean, he took HMS Pegasus to Halifax, without permission from the Royal Navy. William was ordered to winter in Quebec, although he would take his ship back to Britain, arriving in Portsmouth on December 1787. William received his second posting to British North America in July 1788, as the commander of HMS Andromeda. He served in North America for another year, stationed in cities including Halifax. Prince Edward with the Star of the Garter, voted to him by the Nova Scotia House of Assembly in 1798. Prince Edward, Duke of Kent and Strathearn became the second member of the Royal Family to tour the Canadian colonies, and the first to live there for an extended period of time. Stationed at Gibraltar in 1790, he requested to be transferred to the Canadian colonies, in an effort to avoid the extreme Mediterranean heat. Arriving in Quebec City in 1791, he came as the colonel for the 7th Regiment of Foot, a military unit garrisoned in Quebec. Shortly after his arrival, Edward was called upon by the Lord Dorchester, the Governor-in-Chief of the Canadas, as 40 First Nations chiefs travelled to Quebec City to complain about American border incursions. Taking advantage of Edward's princely status, the Governor-in-Chief presented the Prince to First Nations' chiefs proclaiming "Brothers! Here is Prince Edward, son of our king, who has just arrived with a chosen band of his warriors to protect this country," and subsequently named Edward as second-in-command of British forces in the Canadas. Edward began to tour the Canadas in August 1791, departing from Quebec City to Montreal, Kingston, the Thousand Islands, and Newark-on-the-Lake. Edward returned to Quebec City in time to act as an observer for the election of the first Legislative Assembly of Lower Canada, in Charlesbourg in June 1792. Edward is credited with the first use of the term "Canadian" to mean both French and English settlers in the Canadas. Witnessing a riot breaking out between two groups at the polling station, he entreated the public in French, "I urge you to unanimity and concord. Let me hear no more of the odious distinction of English and French. You are all His Britannick Majesty's beloved Canadian subjects." With the outbreak of the French Revolutionary War, Edward was promoted to Major-General, and ordered to proceed to the Caribbean in January 1794. As the St. Lawrence River was frozen over for the winter, he was to travel overland to Boston, before boarding a ship bound for Martinique. In doing so, he became the first member of the Royal Family to enter the newly-formed United States. Following the West Indies campaign in the spring of 1794, he sailed for Halifax aboard HMS Blanche. Arriving on 10 May 1794, he left the city in June to tour Nova Scotia, and the newly-established colony of New Brunswick, visiting Annapolis Royal, and Saint John. He was later made the Commander-in-Chief of the Maritimes. During his time in Nova Scotia, he presided over the expansion of Halifax, and improved the city's defences, due in part to his ability to secure funds from London. He also worked to improve communications between the Canadian colonies, creating the first telegraph signal system in North America, and improving mail service between Halifax and Lower Canada. Edward departed for Britain in August 1800, although he formally maintained his position as Commander-in-Chief of the region until 1802. In 1811, Edward sought to obtain the appointment as the Governor General of the Canadas, although failed to do so. The 19th century saw the beginning of modern royal tours in the country, with travel becoming easier and faster due to technological innovations such as the steamship, and rail transports. The mid-19th century saw the last time a member of the royal family make the transatlantic crossing by sailing ship; as royal family members began to travel by steamship in the late-19th century. While travelling through Canada, multiple modes of transportation were used when touring within Canada, including rail, on foot, and various-sized water vessels. On the 14 May 1859, the Legislative Assembly of the Province of Canada petitioned Queen Victoria, and other members of the royal family to visit Montreal for the opening of Victoria Bridge. Unwilling to leave London in the hands of rivaling politicians, Victoria instead accepted the Canadian invitation on behalf of her son, Albert Edward, the Prince of Wales (later Edward VII). The Prince of Wales undertook a two-month tour of Newfoundland, New Brunswick, Nova Scotia, Prince Edward Island, and the Province of Canada in 1860. The Prince of Wales' royal tour was used as the standard model for future royal tours for the next century. The arrival of Albert Edward, Prince of Wales aboard HMS Hero, in St. John's harbour, July 1860. The Prince of Wales reached St. John's, Newfoundland, on 24 July 1860, aboard HMS Hero. The welcome reception the Prince of Wales received set the pattern for other welcome receptions during the royal tour, which typically included an official address at a levee, and a formal ball held in the Prince of Wales' honour. During his time there, he attended the St. John's Regatta, and was gifted a Newfoundland dog on behalf of Newfoundlanders. Travelling from St. John's he arrived in Halifax on 2 August. While in Halifax, he visited the Prince's Lodge, the country home used by his grandfather, the Duke of Kent and Strathearn. From Halifax, the royal party boarded a train and stopped in Windsor, and Hantsport, where they boarded HMS Styx to cross the Bay of Fundy to Saint John. On 4 August, the Prince travelled through the St John River on the steamer Forest Queen to Fredericton. During his time there, he attended a royal reception, and inaugurated a park. Following his visit to Fredericton, he travelled to Pictou, Nova Scotia to board HMS Hero, returning to several communities, including Saint John, and Windsor. He landed at Charlottetown, Prince Edward Island, on 10 August, where he was welcomed by George Dundas, the Governor of Prince Edward Island, and proceeded to Government House. There, he held audience with the Executive Council of Prince Edward Island. Along with formal ball and levee, the Prince toured the countryside around Charlottetown, and visited Province House, where he received an addresses from the Executive Council. Upon his departure, he left with the Governor £150 for charitable use. The Prince of Wales dedicating Victoria Bridge in Montreal, as a part of his tour of Newfoundland, Prince Edward Island, Nova Scotia, and the Province of Canada in 1860. The Prince of Wales was formally welcomed into the Province of Canada by a Canadian delegation, who came aboard HMS Hero near Percé Rock. The Canadian welcome delegation consisted of the Governor General of the Province of Canada, Edmund Walker Head, and Joint Premiers, George Etienne Cartier, and John A. Macdonald. Arriving in Quebec City on 17 August, the Prince knighted Narcisse Belleau, Speaker of the Legislative Council, and Henry Smith, Speaker of the Legislative Assembly. During his time there, he also visited Montmorency Falls, and made an address at the Université Laval. Following his visit to Quebec City, the Prince of Wales proceeded towards Montreal aboard HMS Hero, joined by several members of the Legislative Assembly near Trois-Rivières. Arriving in Montreal, he took a specially-built open railway car to the Victoria Bridge in Pointe-Saint-Charles, and tapped in-place the final-laid stone for the bridge. During his five-day stay in Montreal, he stayed at the viceregal residence Spencerwood, and inaugurated the city's Crystal Palace, recalling the favourable impression made by Canadians at the Great Exhibition in an address to the crowd. At Ottawa, the Prince laid the foundation stone of the parliament buildings, canoed on the Ottawa River, and rode a timber slide on the Chaudière Falls. Travelling towards Toronto aboard the steamer Kingston, visits were planned for Belleville, and Kingston, although anti-Catholic demonstrators from the Orange Order prevented the Prince from disembarking. In an attempt to not embroil the Prince in a controversy, Henry Pelham-Clinton, the Under-Secretary of State who joined the Prince on his tour, informed mayors that they would not disembark until the demonstrators were dispersed. Sailing further west, the Prince visited Cobourg, Rice Lake, and Peterborough, where he received a reception from the Mississaugas. He then proceeded to Port Hope, re-boarding Kingston to sail on to Toronto. During a levee in Toronto, the Prince received a delegation from Belleville and Kingston, tending apologies for the early incident. On 10 September, he took a one-day excursion to Collingwood, before returning to Toronto the following day. On his way back, he visited and received addresses from Aurora, Barrie, Bradford, and Newmarket. In Toronto, the Prince attended the Royal Canadian Yacht Club's regatta, agreeing to become its patron; and opened Allan Gardens, and Queen's Park to the public. He departed the city for London, Ontario on 12 September, visiting Guelph and Stratford on the way. From London, he travelled to Sarnia, in order to attend a gathering of 150 First Nations representatives in the Province of Canada. Following this gathering, he briefly returned to London, before travelling by railway to the Niagara Peninsula. The Prince of Wales touring Niagara Falls, Canada West, September 1860. In the peninsula, he visited Brantford, Chippewa, Fort Erie, and Queenston. The Niagara Falls were illuminated for the first time during his tour of the falls. There, he rode on the Maid of the Mist. At Queenston, he met with 160 War of 1812 veterans, dedicated a rebuilt Brock's Monument, and visited Laura Secord. From Queenston, he moved towards Niagara-on-the-Lake, St. Catherines, and Hamilton. Completing his royal tour of the Province of Canada in late-September, the Prince of Wales departed for the United States from Windsor, Ontario. Taking a month-long personal tour of the United States, he travelled under the pseudonym "Lord Renfrew," in an attempt to not attract attention to himself. The Canadian co-premieres saw-off the Prince's during his departure from Canada, and again from the United States, travelling to Portland, Maine on 20 October 1860 to see the Prince off. In 1861, Prince Alfred took a five week tour of The Maritimes, Newfoundland, and the Province of Canada. While escorting Prince Alfred through Canada West, the Governor General of Canada used the opportunity to make sketches of American defences around the Great Lakes. During his 1869 royal tour, Prince Arthur met with the Chiefs of the Six Nations at the Mohawk Chapel. From 1869 to 1870, The Prince Arthur was stationed in Canada as a British Army officer in the Rifle Brigade's Montreal detachment. Arriving in Halifax, he undertook a two-month royal tour of the colony of Prince Edward Island, and the newly formed Dominion of Canada, before returning to military duty in Montreal. In the same year, the Six Nations of the Grand River conferred the title of chief to The Prince Arthur. In a formal ceremony, the chief of the three "clans" of the Mohawks received The Prince, and conferred upon him the name "Kavakoudge," meaning "the sun flying from east to west under the guidance of the Great Spirit." Although the title of chief was bestowed as an honourary title to a number of individuals, Alfred underwent the necessary rituals to formalize the title in Mohawk society. During his time in Canada, The Prince Arthur became the first member of the royal family to attend the opening of the Canadian parliament, in February 1870. The Prince Arthur, along with his regiment, was present at the Battle of Eccles Hill, a raid conducted by the American-based Fenian Brotherhood, on 25 May 1870. The Prince was awarded the Canada General Service Medal for his participation in the Fenian raids. Returning to the United Kingdom in 1870, The Prince Arthur would return to Canada on two more occasions, the latter visit as the Governor General of Canada. Other members of the royal family were also in Canada as a part of their military service during the late-1870s and early-1880s. Prince Alfred was stationed at Royal Naval Dockyard, Halifax from time to time between 1878 and 1883, as Commander of the Royal Navy's North Atlantic Squadron. Prince George of Wales (later George V) was stationed in the Maritimes in 1882 as a midshipman on HMS Cumberland. During his time there, he drove the last spike into Newfoundland's first railway, the Harbour Grace Railway. In 1878, Benjamin Disraeli, the Prime Minister of the United Kingdom, requested the Marquess of Lorne be appointed the next Governor General of Canada, with his wife, Princess Louise, Duchess of Argyll serving as the viceregal consort of Canada. Disraeli's nomination of Lorne was largely motivated by his desire to see a member of the royal family reside in Canada for an extended period. Prior to his appointment as the Canadian Governor General, Lorne was virtually unknown to the public, with little concrete record of public service. The attraction for appointing Lorne to the office was having his spouse, Princess Louise, reside in Canada. Princess Louise accompanies the Marquess of Lorne, the Governor General of Canada during the opening the 4th Canadian Parliament, 1879. Arriving in Canada on 23 November 1878, the viceregal couple was greeted by Prince Alfred, who was serving as a Royal Navy officer, stationed in Halifax. Lorne was formally sworn in as the Governor General in Province House, Halifax, before they proceeded towards the capital, in Ottawa. Arriving in Ottawa on 2 December, the head of the Canadian ministry, John A. Macdonald, was not present at the viceregal welcome reception. Macdonald's absence from the welcome reception was depicted as a purposeful insult to the princess by the opposition Liberal Party. They proceeded to take a private trip to Niagara Falls in January 1879, before returning to Ottawa to open the 4th Canadian Parliament, on 13 February 1879. They undertook an official tour of Eastern Canada from mid-May 1879, touring Montreal during Victoria Day, awarding prizes to officer cadets of the Royal Military College of Canada in Kingston. On 9 June, they opened Terrasse Dufferin in Quebec City, and later laid the cornerstone of Porte Kent, gifted to the city from Queen Victoria. Following their tour of Quebec, they proceeded towards The Maritimes and Ontario. In Toronto, they opened the first Canadian National Exhibition, and attended the Queen's Plate. During their time in Ottawa, both Lorne and Louise worked towards the creation of a national arts association, establishing the Royal Canadian Academy of Arts in 1880. On 14 February 1880 in Ottawa, Princess Louise was injured after her horse-drawn sleigh was turned over. Hitting her head on the metal frame of the sleigh, Louise suffered from neuralgia after the incident. The public was not made aware of the event, with the aide-de-camp to the Governor General downplaying the incident to the press. She did not make another public appearance until April 1880. While recovering, she was visited by her brother The Prince Leopold. Louise and Leopold privately toured Quebec, Ontario, and the American city of Chicago until 31 July 1880, when both returned to the United Kingdom. Princess Louise and the Marquess of Lorne visiting a street market in Ottawa around Christmas, c. 1880s. During Lorne's 1881 tour of the Northwest Territories, he proposed a section of the territory take its Alberta after his wife (whose full name was Louise Caroline Alberta). Similarly, Princess Louise was the one who proposed the name for Regina, from the Latin word for Queen. Louise returned to Canada until 4 June 1882, although rumors of a Fenian plot against her forced her to remain in the Citadelle of Quebec, a military installation used by the Canadian militia, and the secondary residence for the Monarch, and the Governor General. On 30 August, Lorne and Louise set out for an official tour of British Columbia, visiting Victoria, and meeting with a First Nations delegation in New Westminster. Louise remained in Victoria as Lorne continued with the official tour into the British Columbia Interior. They remained in the province until 7 December 1882, with their tour extended to counter secessionist sentiments in the province, a result of the federal government's failure to produce a transcontinental rail link by 1881. Robert Beaven, the Premier of British Columbia was said to have suggested the province secede from Canada, and establish an independent kingdom with Louise as its Queen. The resulting crisis had spurred Lorne to push the Canadian government to hasten the development of the Canadian Pacific Railway. Louise was visited by another member of the royal family, Prince George of Wales, in April 1883. Shortly before the end of his fifth year as Governor General, Lorne declined an option to serve the position for another year. His decision to turn down an additional year in office was questioned by some, with Queen Victoria suspecting that Lorne was jealous of Louise's popularity with Canadians, in contrast to his own. The Marquess and Princess Louise concluded their term in Canada with a farewell tours in Montreal, and Toronto, leaving for the United Kingdom from Quebec City on 27 October 1883. In 1890, Prince Arthur conducted another tour of Canada, arriving in British Columbia from his earlier service with the British Army in the British Raj. During this tour, he travelled east towards the Maritimes, primarily by railway, before continuing on to the United Kingdom. Princess Marie Louise arrived in Canada in 1900 to tour the country, however controversy surrounding her spouse, Prince Aribert of Anhalt forced her to return to the United Kingdom shortly after her arrival. After Prince Aribert was found in bed with another man, his father, Frederick I, Duke of Anhalt, accused Marie Louise of indecency, claiming that his son was denied his conjugal rights. Marie Louise was at Rideau Hall when the Governor General gave her two telegrams instructing her to return to the United Kingdom immediately. Her marriage with Prince Aribert was annulled in December 1900, with his father using his prerogative as a reigning Duke of Anhalt to annul the marriage. Prince George in Montreal and Quebec City. He visited most of the provinces during his 1901 royal tour. The first royal tour to take place since the death of Queen Victoria was conducted by the second son of the reigning king, Prince George, Duke of Cornwall and York (later George V), his spouse, Mary, Duchess of Cornwall and York (later Queen Mary), and the Duke's brother, Prince Alexander of Teck (later the Earl of Athlone). The tour in Canada formed a part of a larger eight-month royal tour of the British Empire that began on 16 March 1901, with the Duke and Duchess' departure from Portsmouth, United Kingdom. The Canadian portion of the tour was originally planned to begin in British Columbia, proceeding eastward through the country. However, after South Africa was added onto the royal tour, the decision was made to begin to the royal tour in Quebec City, and conclude it in Halifax. As the period of court mourning for Queen Victoria's death had not yet expired during their time in Canada, public balls, banquets, and levees planned for the royal tour were cancelled, with only official dinners, concerts, receptions, and reviews taking place. During the tour, Prince George kept a methodical record of his activities, recording that he shook the hands of 24,855 people at official receptions; received 544 addresses; laid 21 cornerstones; gave 100 speeches; and presented 4,329 medals. The Canadian portion of the 1901 royal tour began 16 September 1901, when the RMS Ophir arrived in Quebec City. The royal party – which consisted of 22 people, landed at Quebec City on 16 September. During his time in Quebec City, Prince George invested Lieutenant Richard Ernest William Turner with the Victoria Cross for his conduct during the Battle of Leliefontein in a ceremony at the Plains of Abraham, and spoke to students at the Université Laval. Moving west of Quebec City by railway, the group made stops to Montreal, and Ottawa. Throughout the royal tour, Prince George placed an emphasis on praising the creation, and expansion of the country during his own lifetime, giving a speech about the country's development and growth in Ottawa and Winnipeg. The royal party rides a timber slide near Ottawa during the 1901 royal tour. In Ottawa, Prince George dedicated the Alexandra Bridge in Ottawa, rode a timber slide, and watched the lacrosse final for the Minto Cup, a match he enjoyed so much he kept the ball that was used. Departing from Ottawa, they passed through Ontario, creating "incredible excitement seldom seen since the visit of his father in 1860." The Duke and Duchess arrived in Manitoba where the former opened the new science building at the University of Manitoba, and then to Regina in the Northwest Territories. In Calgary, they met with First Nations chiefs and viewed exhibitions, before concluding their western-leg of their tour in Vancouver and Victoria. They group then turned back again towards Banff, where the Duchess went to Tunnel Mountain and Lake Louise, while the Duke went to Poplar Point. After passing back through Regina, they reunited in Toronto, welcomed by the Toronto Mendelssohn Choir, and attended concerts at Massey Hall. They proceeded to tour throughout Southern Ontario, before returning to Montreal, where the Duke opened the newly rebuilt Victoria Bridge. The Canadian tour ended with a trip through Saint John, and their departure from Halifax. Following their departure from Halifax, the global royal tour proceeded towards Newfoundland, a separate colony not associated with Canada at the time. In Newfoundland, they received nine-month old Newfoundland dog, which was later given their son, Prince Edward (later Edward VIII). George, Prince of Wales attending a military review for the Canadian militia, 1908. In 1908 the Canadian government asked King Edward VII to preside over the tercentenary celebrations for the founding of Quebec City. Edward VII would accept the invitation on behalf of his son, George, Prince of Wales (later George V). The Prince of Wales arrived at Quebec City aboard the Royal Navy cruiser, HMS Indomitable. 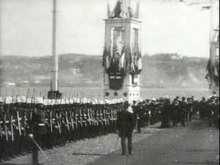 Unlike his earlier tour in 1901, his royal tour in 1908 was limited to the ceremony in Quebec City, as well as a military review of the Canadian militia on the Plains of Abraham. From 1911 to 1916, Prince Arthur, Duke of Connaught and Strathearn served as Canada's Governor General, with the Duchess of Connaught and Strathearn serving as his viceregal consort. The Duke was the first member of the royal family to serve the office of Governor General of Canada. Originally his appointment was for only two-years, although at the request of Robert Borden, the Prime Minister of Canada, his tenure would later be extended to five-years. The Duke, Duchess, and their daughter, Princess Patricia of Connaught, arrived in Quebec City on 13 October 1911 and was later sworn into office at the Parliament of Quebec. Several weeks after being sworn in, he presided over the opening of the Parliament of Canada in Ottawa. Prince Arthur visits Valcartier base as the Governor General in 1914. He served the position from 1911 to 1916. The Duke and Duchess conducted his first tour as Governor General in 1911, proceeding to Toronto, Hamilton, Kingston, and finally Montreal on 27 November 1911. Further tours with the Duke, and Princess Patricia, were undertaken in May 1912, to Winnipeg, and the Maritimes. On 28 August 1912, the Duke, Duchess, and their daughter conducted a tour of the west, visiting Sault Ste. Marie, Saskatoon, Prince Albert, Edmonton, Calgary, Banff, Vancouver, Prince Rupert, and Victoria, where they inspected personnel of the Royal Canadian Navy at Esquimalt Royal Navy Dockyard. They then proceeded towards Medicine Hat, Regina, and Brandon, before concluding their tour in Toronto and Ottawa. While serving as the Governor General, the Duke inaugurated the Saskatchewan Legislative Building, and laid the cornerstone for the Cathedral of St. John the Evangelist in Regina,, and for the new Provincial Library at the British Columbia Parliament Buildings. The Duke returned to Banff on two occasions, in August 1914, and May 1916. In addition to Canada, he also visited Newfoundland, a separate dominion of the British Empire in 1914. In 1913, The Prince Albert (later George VI) conducted his first royal tour of the Canada, as well as Newfoundland, while serving aboard the Royal Navy cruiser HMS Cumberland. In January 1913, the Duchess was hospitalized as a result of her declining health, with the viceregal family returning to London, UK, in March 1913. During this period, the Duke, continuing to serve as Governor General, received regular correspondences from Borden through telegraph. After the Duchess recovered, the family returned to Canada in October 1913. During World War I, the Duke was involved in recruitment, and raising the morale of soldiers. Princess Patricia worked for the Canadian Red Cross, and continued working for a Canadian hospital in Orpington, UK, after her father's term as Governor General ended in 1916. Several months after Centre Block on Parliament Hill was ravaged by a fire, the Duke laid the memorial cornerstone for its replacement on 1 September 1916. The Duke's tenure as Govenor General ended on 16 October 1916. After the end of World War I in November 1918, Edward, Prince of Wales (later Edward VIII) set out to develop his role as the Prince of Wales through a tour of the Empire, with his first tour occurring in the dominions of Newfoundland and Canada in 1919. Organization for the tour was undertaken by Joseph Pope, the Assistant Clerk to the Privy Council for Canada. Unlike earlier tours, the 1919 royal tour dropped the rigid formalities of earlier tours, partly due to authorities' inability to control the crowds who came to see the Prince. The informality of the tour was matched by the Prince of Wales, whose informal dress, and mannerisms had struck the right note with Canadians. Boarding HMS Renown on 5 August 1919, Edward proceeded towards St. John's, Newfoundland, and Charlottetown, before proceeding towards Quebec City on 21 August 1919. Proceeding towards Ontario, he laid the foundation stone of the Peace Tower on Parliament Hill, met with the League of Canadian Indians at Sault Ste. Marie, and took a three-day canoe trip down the Nipigon River to fish and hunt with two Ojibwa guides. On the 26 August, he inaugurated Warriors' Day at the Canadian National Exhibition. He then travelled to Regina, where he renamed a library the Prince of Wales Library. He then proceeded towards Vancouver, toured the area, attended a civic reception and military ball, as well as opening the New Westminster Exhibition. While in Alberta, he was named Chief Morning Star by the Chiefs of the Nakoda First Nations. The Prince also went on to Victoria, where he laid the foundation stone of a statue of Queen Victoria on the grounds of the British Columbia Parliament Buildings. Edward, Prince of Wales and Prince George at Rideau Hall (seated, fifth and sixth from the left, respectively), during their 1927 royal tour. In 1923, the Prince of Wales was in Canada on a on a visit, and work on his privately-owned ranch, E. P. Ranch. Arriving at Quebec City on 12 September, he made stops in Ottawa and Winnipeg before reaching his private ranch near Calgary, known as E. P. Ranch. He made another private visit to his ranch in 1924, as well as touring as well various towns and cities; in the latter year, he stopped at Rideau Hall for various official functions and again frustrated his staff by disappearing for dancing and golf. In 1926, the brother to the Prince of Wales, The Prince George (later Duke of Kent), arrived in Canada and actively took part in squash, badminton, and tennis games played in Rideau Hall's Tent Room; the Governor General, The Marquess of Willingdon, said of the Prince: "Such a nice boy, but shy, & as mad ib exercise as the P. of W." Prince George, along with the Prince of Wales, conducted another royal tour of Canada in 1927. During the tour, the Prince of Wales and the Prince George opened Union Station in Toronto, the Princes' Gates at Exhibition Place. King George VI and Queen Elizabeth visit the King's Plate in Toronto, during the 1939 royal tour. The 1939 royal tour of Canada was a cross-Canada royal tour by King George VI and Queen Elizabeth. It was one of the first visits of a reigning monarch to Canada (in 1926, Queen Marie of Romania also visited the country). This tour marked the first time that the sovereign's official Canadian birthday was marked with the monarch himself present in the country; the occasion was marked on Parliament Hill with a celebration and a Trooping of the Colour. Later, during a tour of Canada, Queen Elizabeth The Queen Mother stated in a speech: "It is now some 46 years since I first came to this country with the King, in those anxious days shortly before the outbreak of the Second World War. I shall always look back upon that visit with feelings of affection and happiness. I think I lost my heart to Canada and Canadians, and my feelings have not changed with the passage of time." Alexander, Earl of Athlone was sworn in as Canada's Governor General on 21 June 1940, becoming the second member of the royal family to serve the position. Alexander's spouse, Princess Alice, Countess of Athlone, accompanied the Earl during his time in Canada, as his viceregal consort. He served as Canada's Governor General throughout most of World War II, completing his term in April 1946. Alexander was previously considered for the role in 1914, although he refused the posting because of the outbreak of World War I.
Alexander, Earl of Athlone inspecting soldiers as the Governor General of Canada, October 1940. In addition to the Earl and Countess of Athlone, Alastair, Duke of Connaught and Strathearn has also been residing in Canada from 1940, as the aide-de-camp to Alexander in his capacity as Governor General. On 23 April 1943, Alastair was found dead on the floor of his room at Rideau Hall. He had died from hypothermia. Newspapers at the time cited the cause of death as "natural causes." In 1941, Prince George, Duke of Kent visited several Royal Canadian Air Force bases in Canada. In the same year, Edward, the Duke of Windsor (formerly Edward VIII) visited Canada to stay at his private ranch in Alberta. He entered Canada at North Portal, before proceeding towards Calgary the next day. As the visit was only few years removed from the 1936 abdication crisis, he was initially discouraged from visiting by the Canadian Prime Minister, William Lyon Mackenzie King. However, King would later send Edward a telegram welcoming him shortly after he entered the country. Edward departed Canada after spending nine days there, summoned back to the Bahamas as its Governor, after a hurricane struck the islands. Edward would visit Canada on two more occasions, visiting New Brunswick in 1945, and Alberta in 1950. During his time in Alberta, Edward slept at the viceregal suite of the Palliser Hotel in Calgary; as the state of his ranch had deteriorated in the years since his last visit. In 1945, Edward sought the appointment as the Governor General of Canada, although failed to obtain it. By 1945, Alan Lascelles, the private secretary of George VI, and Shuldham Redfern, Secretary to the Governor General of Canada, were discussing the idea of the King making regular flights to Canada to open parliament and perform other constitutional and ceremonial duties. The notion was eventually forgotten. Elizabeth II has conducted 20 official tours of Canada from 1951 to 2000. She first toured Canada in 1951, as Princess Elizabeth, Duchess of Edinburgh. In her subsequent tours of the country, she toured it as its Queen. In addition to official tours, in the 20th century, the Queen had made nine stopovers in Canada, in order to refuel the plane she was on. Princess Elizabeth along with Prince Philip during their 1951 royal tour. Princess Elizabeth, Duchess of Edinburgh, and her husband, the Duke of Edinburgh, made their first appearance in Newfoundland, Prince Edward Island, Nova Scotia, Ontario, Saskatchewan, British Columbia, and Alberta in 1951, on behalf of her ailing father. The National Film Board of Canada produced a documentary film Royal Journey, chronicling the 1951 royal tour. The couple toured New Brunswick; after the Princess and Duke arrived at Fredericton's Union Station on 6 November, they were there greeted by both Lieutenant Governor David Laurence MacLaren and hundreds of well-wishers, and moved on to tour the University of New Brunswick, Christ Church Cathedral, and the Legislative Assembly Building. It was then on to Saint John, where the royal couple travelled in a motorcade watched by some 60,000 people, visited a veterans' hospital, and attended a civic dinner at the Admiral Beatty Hotel, where the silver flatware designed specifically for the 1939 visit of the King was used. After an overnight on the royal train, Princess Elizabeth and the Duke of Edinburgh made whistle-stops in Moncton and Sackville before departing the province. In Toronto, she took in a Toronto Maple Leafs game at Maple Leaf Gardens and greeted Ontarians at numerous official functions. Queen Elizabeth II and Prince Phillip at the opening of the 23rd Canadian Parliament, 14 October 1957. Elizabeth returned to Canada in 1957, there giving her first ever live television address, appointing her husband to her Canadian Privy Council at a meeting which she chaired, and on 14 October, opening the first session of the 23rd parliament. About 50,000 people descended on Parliament Hill to witness the arrival of the monarch. Due to the financial austerity of the times, the pageantry was muted in comparison to what would be seen at a similar event in the United Kingdom. June Callwood said in her coverage of the tour for Maclean's: "The Queen's role in Canada, it appeared to some observers, hinged on calculated pageantry, just enough to warm the pride of Canadians who revere tradition and stateliness above state but not so much as to antagonize those who consider royalty a blindingly off-colour bauble in an age of lean fear." In Saskatchewan, the Queen inaugurated the natural gas-fired Queen Elizabeth Power Station on the South Saskatchewan River. Two years later, in 1959 the Queen returned and toured every province and territory of the country; Buckingham Palace officials and the Canadian government opted to dub this a "royal tour", as opposed to a "royal visit", to dispel any notion that the Queen was a visiting foreigner. Controversy arose in the run-up to the visit when CBC personality Joyce Davidson, while being interviewed by Dave Garroway on NBC's Today Show, said that as an "average Canadian" she was "pretty indifferent" to the Queen's forthcoming visit. Davidson was lambasted in the Canadian press and by many indignant Canadians for her comment. Regardless, the Queen toured the entire country, specifically directing that events she attended should be public, rather than closed luncheons or receptions; further, popular Canadian athletic stars were invited to royal events for the first time, so that during her tour the Queen met with Jean Béliveau, Sam Etcheverry, Maurice Richard, Punch Imlach, and Bud Grant. Motorcade of The Queen at the intersection of Yonge and Front Street, Toronto, during her 1959 royal tour. One of the most important events of this trip was the official opening of the St. Lawrence Seaway, along with President Dwight D. Eisenhower, where, in Prescott, Ontario, the Queen made her first live appearance on Canadian television. During this tour, the Queen paid numerous visits to Canadian industries, and again made a visit to the United States as Canada's head of state, stopping in Chicago and Washington, D.C., with Diefenbaker as her attending minister. The Prime Minister insisted that the Queen be accompanied at all times by a Canadian Cabinet minister, being determined to make it clear to Americans that the Queen was visiting the United States as the Canadian monarch, and that "it is the Canadian embassy and not the British Embassy officials who are in charge" of the Queen's itinerary. Her speeches in Chicago, written by her Canadian ministers, stressed steadily the fact that she had come to call as Queen of Canada. In this vein, the Queen hosted the return dinner for Eisenhower at the Canadian Embassy in Washington. The Queen returned to New Brunswick, at the end of her pan-Canada tour. The sovereign presided over a Queen's Scout recognition ceremony in Fredericton, visited the veterans' hospital in Lancaster, and undertook a walkabout in Victoria Park, Moncton. At Pointe-du-Chêne, the royal couple visited briefly with the families of fishermen who had died the previous month in a storm off Escuminac, making a donation to the New Brunswick Fisherman's Disaster Fund that was established in honour of the deceased. The "Queen's Steps" staircase, used by the Queen on the last day of her 1959 royal tour, at CFB Halifax. Unknown to all involved, the Queen was pregnant with her third child. Prime Minister Diefenbaker urged her to cut the tour short after her disclosure to him at Kingston, Ontario, but the Queen swore him to secrecy and continued the journey, leaving the public announcement of the upcoming birth until she returned to London. Once the news was released, criticism of the tour that had simmered during its progress unleashed in full: Diefenbaker was blamed for pushing the Queen to carry on a grueling continent-wide trip, and the brevity of stops necessary to complete such a journey, combined with the formality and inaccessibility of events, led to calls for a cease to that format of royal tour. The Albertan stated: "The fact is that royalty has no roots in Canada. And if roots must be put down, they certainly should be of a different kind than those which are historically proper for Britain." Prior to the tour, the President of the Saint-Jean-Baptiste Society, with the support of the Mayor of Quebec City, requested of the tour officials that, on the evening of Saint-Jean-Baptiste Day, Her Majesty light the main bonfire in celebration. Though the Queen did lay a wreath at the James Wolfe Monument on the Plains of Abraham, the Queen's Canadian Secretary at the time, Howard Graham, left the bonfire off the itinerary, leading to complaints. Successes were also noted, especially in the Crown's assistance in entrenching the newly emerging Canadian identity; the Queen ensured that the Red Ensign (then Canada's de facto national flag) was flown on the royal yacht, and she stood to attention for the duration of each playing of "O Canada", the country's then still unofficial national anthem, sometimes even joining in the singing. The Queen walks with John Clyne, the Chancellor of the University of British Columbia during her 1983 royal tour of Canada. Queen Elizabeth II also celebrated the centennial of the Confederation Conferences in Charlottetown on 6 October 1964. On 10 October, as she was touring the streets of Quebec City, a turbulent riot occurred and opposed anti-monarchist Quebec nationalists with the police. Since then, the event has been known as Samedi de la matraque ("Truncheon Saturday"). In 1971, the Queen was in British Columbia to celebrate the centennial of the province's entry into Confederation. She toured Alberta and Saskatchewan in July 1973, to celebrate the centennial of the Royal Canadian Mounted Police, opening the new RCMP museum building in Regina, and in 1978, to open the Commonwealth Games in Edmonton. In Saskatchewan, she dedicated Queen Elizabeth Court, in front of Regina's city hall. 28 June – 6 July 1976: Prince Charles, Prince Andrew and Prince Edward joined the Queen and Prince Philip for the 1976 Olympic Games in Montreal. Princess Anne was a member of the British equestrian team competing in the Olympics in Montreal. The royal family also stopped by Nova Scotia and New Brunswick during the visit. The Queen arrived at Fredericton, New Brunswick, on 15 July, after which she travelled to Woolastook Provincial Park to visit the Boy Scout Jamboree campsite, picniced with 3,500 schoolchildren, toured the Kings Landing Historical Settlement, and attended a provincial dinner with fireworks following. The Queen's second day in New Brunswick brought her to the Miramichi area, where she attended a provincial lunch, visited Chatham and Newcastle, and toured the Burchill Laminating Plant in Nelson-Miramichi. The Queen also journeyed to New Brunswick to celebrate the province's bicentennial in 1984, touching down, along with Prince Philip, at Moncton airport on 24 September, from where the royal party travelled to Shediac, Sackville, Riverview, and Fredericton over the course of three days. While at the Legislative Building, the Queen issued a Royal Warrant augmenting the province's coat of arms with its present crest, supporters, compartment, motto. She also, when in Fredericton, unveiled a plaque in Wilmot Park that honoured Edward Wilmot and recounted the dedication of the park by the Queen's great-grandfather. The Queen opened the University of Northern British Columbia in 1994. Queen Elizabeth II and Prince Philip at Scouts Canada's Fourth Pentathlon Jamboree in 1976. Philip, Duke of Edinburgh, consort to Queen Elizabeth II, has participated in 28 official tours of Canada from 1951 to 2000, with his first in 1951, accompanying her spouse, Princess Elizabeth. During the same period of time, he has also taken 13 private working tours of the country, participating in events such as the Commonwealth Study Conference, or the presentation of the Duke of Edinburgh Awards. Cumulatively, he has made more than 70 visits to Canada, including 19 royal tours with Queen Elizabeth II. The Duke of Edinburgh, has visited the realm on two occasions to open two multi-sport event, the 1954 British Empire and Commonwealth Games, and the 1967 Pan American Games. The trip was one of many visits to Canada the Duke has made without the Queen. Other visits without the Queen occurred in 1960, 1962, 1978, 1979, 1980, and 1998, as he was chairing the Commonwealth Study Conference, hosted in Canada during those years. He has also made 11 trips to Canada in relation to The Duke of Edinburgh's Award. The Duke has also made several visits relating to his role with the Armed Forces. He was appointed the Colonel-in-Chief of the Royal Canadian Regiment on 8 December 1953, he presented the 3rd Battalion's first colours on Parliament Hill in 1973. Charles, Prince of Wales has made 12 official tours of Canada from 1970 to 2000. His first official tour of Canada was in July 1970, touring Ottawa, prior to joining The Queen, the Duke of Edinburgh, and Princess Anne's official tour of Manitoba, to celebrate of the centennial of Manitoba's entry into Confederation. In 1991, the Prince and Princess of Wales toured Ontario; in Toronto, the princess was joined on board the Royal Yacht Britannia by her two sons, Princes William and Harry, and caused some controversy when she broke from established protocol by enthusiastically hugging the two boys after they ran up the gangplank to meet her. After performing official duties in the city, including a formal dinner at the Royal York hotel, the royal family then went on to visit Sudbury, Kingston, Ottawa, and Niagara Falls, where the princes, as their great-great-great-grandfather had done, rode on Maid of the Mist. Four members of the Royal Family—The Queen; Prince Philip; Prince Andrew; and Prince Edward—at the opening of the 1978 Commonwealth Games in Edmonton, Alberta. Queen Elizabeth The Queen Mother, queen-consort to King George VI, and mother of Elizabeth II, has conducted nine official tours of Canada from 1951 to 2000. In 1967, she returned to Nova Scotia and Prince Edward Island to celebrate Canada's centennial in 1967. On a visit in 1985 to Toronto and Saskatchewan she noted, "It is now some 46 years since I first came to this country with the King, in those anxious days shortly before the outbreak of the Second World War. I shall always look back upon that visit with feelings of affection and happiness. I think I lost my heart to Canada and Canadians, and my feelings have not changed with the passage of time." In addition to her nine official tours, she conducted one private working tour in 1965, touring Toronto to celebrate the 50th anniversary of the Toronto Scottish Regiment, a regiment where she holds the position of colonel-in-chief. Elizabeth II's sister, Princess Margaret, Countess of Snowdon had conducted seven official tours of Canada, as well as three private working tours of Canada from 1951 to 2000 Two of her private working tours were conducted in relation to her role as patron of the Princess Margaret Hospital. Official tours include tours of Nova Scotia and British Columbia in 1958. In BC, the princess opened the new floating bridge in Kelowna, with two plaques marking the ceremony. She also presided over the celebrations of the 75th anniversary of Saskatchewan's entry into Confederation. Princess Alexandra, The Honourable Lady Ogilvy had conducted three official tours of Canada, as well as four private working tours of the country from 1951 to 2000. She toured Canada for its centenary in 1967, and also arrived in Halifax in 1973 to mark the bicentennial of the arrival of Hector, the first ship to land at Nova Scotia with Scottish colonists. Anne, Princess Royal has conducted over six official tours of Canada, as well as seven private working tours from 1951 to 2000. Princess Anne presided over the 1970 celebrations of the centennial of Manitoba's entry into Confederation alongside his brother, the Prince of Wales. Prince Andrew, Duke of York conducted five official tours of Canada, as well as 10 private working tours from 1951 to 2000. His first official tour was conducted in 1976, whereas his first private working tour was conducted in the following year, after attending a semester of secondary school at Lakefield College School, in Selwyn, Ontario. He undertook his first official tour of Nova Scotia in 1985, during which, amongst other activities, he visited Halifax and skippered Bluenose II. Other members of the royal family that have conducted either official, or private working tours of Canada include Princess Marina, Duchess of Kent, Princess Alice, Duchess of Gloucester, Mary, Princess Royal, Prince Edward, Duke of Kent, Katharine, Duchess of Kent, the Prince and Princess Michael of Kent, and the Earl and Countess of Wessex. The Queen in Queen's Park, Toronto, during her 2010 royal tour. Elizabeth II has conducted three official tours of Canada in the 21st century. In 2002, Elizabeth II toured the Canadian provinces of British Columbia, New Brunswick, Manitoba, Ontario, Quebec, and the territory of Nunavut, for her Golden Jubilee. In 2005, the Queen was in Alberta again to mark the province's 100th anniversary of entry into Confederation, where she attended, along with an audience of 25,000, a kick-off concert at Commonwealth Stadium, re-designated the Provincial Museum of Alberta as the Royal Alberta Museum, and addressed the Legislative Assembly, becoming the first reigning monarch to do so. The Alberta Ministry of Learning encouraged teachers to focus education on the monarchy and to organize field trips for their students to see the Queen and her consort, or to watch the events on television. In Saskatchewan, the Queen presided over the main events for the centennial of Saskatchewan's creation, as well as touring the Canadian Light Source Synchrotron and the University of Saskatchewan, where, in the Diefenbaker Canada Centre, is stored correspondence between former Prime Minister John Diefenbaker and the Queen. In 2010, Elizabeth II visited Ontario and Manitoba as part of the 2010 royal tour of Canada. Arriving in Ottawa 30 June 2010, she toured the Canadian Museum of Nature and met with Prime Minister Stephen Harper. The following day, the Queen and the Duke of Edinburgh joined the festivities for Canada Day on Parliament Hill. The Royal Tour of Canada ended as the Queen and the Duke of Edinburgh departed for New York on 6 July 2010, following visits to Toronto and Waterloo. Charles, Prince of Wales visiting Halifax, Nova Scotia during his 2014 royal tour of Canada. Since 2001, the Prince of Wales has conducted five official tours in Canada, in April 2001, November 2009, May 2012, May 2014, and June-July 2017. He was accompanied by his spouse, Camilla, Duchess of Cornwall on the latter four tours. In 2001 he toured through Ottawa, where his interactions with the crowds kept Prime Minister Jean Chrétien waiting for twenty minutes. He also toured Regina, Moose Jaw, Assiniboia, Saskatoon, Whitehorse, and Mayo. In Saskatchewan, he turned the sod for the Prince of Wales Cultural and Recreation Centre in Assiniboia and dedicated the Anniversary Arch outside Regina's YMCA. On 14 December, it was announced that Camilla and Charles would visit several provinces in Canada, including New Brunswick, Ontario, and Saskatchewan. This trip is in honour of the Queen's Diamond Jubilee in February 2012. In 2017, the Prince of Wales and Duchess of Cornwall were in Canada from 29 June to 1 July for Canada Day celebration and for the country's sesquicentennial celebrations. Prince William and the Duchess of Cambridge at an inspection for the Governor General's Foot Guards during their 2011 royal tour of Canada. William, Duke of Cambridge has conducted two official tours in Canada in the 21st century. The 2011 royal tour of Canada was the first time Prince William, and Catherine, Duchess of Cambridge, visited Canada as the Duke and Duchess of Cambridge. The tour saw the newlywed couple tour Ottawa, Montreal, Quebec City, Charlottetown, Summerside, Yellowknife, Calgary, as well as the fire-ravaged community of Slave Lake. It was the first such tour undertaken by the Duke and Duchess since their marriage two months prior. In 2016, the Duke and Duchess of Cambridge, along with their children, Prince George of Cambridge, and Princess Charlotte of Cambridge, conducted an official tour of British Columbia and Yukon, visiting Victoria, Vancouver, Bella Bella, Kelowna, Whitehorse, Carcross, and Haida Gwaii. Anne, Princess Royal has conducted seven private working tours, and one official working tour of Canada since 2001. She conducted private working tours in August-September 2003, June 2004, June 2007, February 2010, April 2010, October 2013, and February 2015; and one official tour in November 2014. The Princess Royal's private tours to Canada are typically conducted in association with her honorary role as the colonel in chief of six units in the Canadian Forces. In April 2010, she visited St. John's to celebrate the anniversary of the Royal Newfoundland Regiment, as well as Regina, to celebrate its centennial. The Princess Royal also a visit to Barrie on 22 October 2013 to commemorate the opening of park with military significance and to visit the Grey and Simcoe Foresters, for which she their current colonel-in-chief. Prince Edward, Earl of Wessex with members of the Monarchist League of Canada in Toronto, 2005. Since 2001, Prince Edward, Earl of Wessex has conducted 17 private working tours in Canada. His first visit to Canada in the 21st century occurred in October 2001, with his latest tour occurring in October-November 2015. Most of these visits were conducted for ceremonies relating to the Duke of Edinburgh Award. In 2003, Prince Edward opened two parks in Saskatchewan, the Prince Edward Park in Melfort and the Queen's Golden Jubilee Rose Garden in Moose Jaw. In 2005, the Earl and Countess of Wessix, toured Ontario; the Earl visited Peterborough, Prince Edward County, and Toronto, while his spouse, Sophie, Countess of Wessex, went to Welland to be installed as Colonel-in-Chief of the Lincoln and Welland Regiment. The Countess has accompanied her husband, Prince Edward on a number of tours to Canada. Their tour of Canada in 2002 marked the Countess' first tour outside of the United Kingdom. In 2009, Countess of Wessex opened the Air Force Museum of Alberta in Calgary, spending some hours visiting its displays. The Countess of Wessex has also conducted private working tours of her own, as was the case in November 2015. 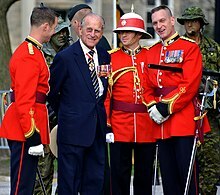 Prince Philip with members of The Royal Canadian Regiment in 2013. In the 21st century, Prince Philip has conducted three official tours alongside Queen Elizabeth, on October 2002, May 2005, and June 2010. In addition to official tours, he has conducted three private working tours, in October 2001, April 2004, and April 2013. In 2001, he visited Toronto in order to present the Duke of Edinburgh Award to recipients, and participate in activities relating to the World Wildlife Foundation. In April 2013, David Johnston, the Governor General of Canada, presented Philip with the Order of Military Merit, and inducted him as a Companion of the Order of Canada. On the 27 April 2013, Prince Philip, the Colonel-in-Chief of the Royal Canadian Regiment, visited Toronto in order to present the 3rd battalion its second colours. The Prince Andrew, Duke of York has conducted 16 of private working tours in Canada since 2001. His first tour in the 21st century was on January 2001, whereas his latest tour in Canada occurred on June 2014. In 2003, he came twice, at one point going into the field in full combat uniform to observe tactical exercises and address the troops of the Queen's York Rangers, of which he is colonel-in-chief. Princess Alexandra, The Honourable Lady Ogilvy, has conducted two private working tours of Canada, in April 2010, and October 2012. During her 2010, she visited Toronto and Victoria to attend the 150th anniversary ceremonies for the establishment of The Queen's Own Rifles of Canada, of which she is the colonel-in-chief. In 2012, she returned to Victoria to attend the 100th anniversary for The Canadian Scottish Regiment (Princess Mary's). Since 2001, Prince Harry, Duke of Sussex has visited Canada on two private working tours, on the 26 June 2007, and from September-October 2008. Both visits were conducted for military exercises at CFB Suffield in Alberta. In addition to private working tours, Harry has made informal visits to the country, such as the opening for the 2017 Invictus Games in Toronto. It was during these games that Prince Harry, and his future spouse, Meghan, Duchess of Sussex made their first public appearance together. Prior to their first public appearance, reports had surfaced in 2016 that Harry visited Meghan at her home in Toronto; who was residing in the city from 2011 to 2017 in order to film the television series Suits. ^ a b "Royal Visits from 1786 to 1951". Government of Canada. 24 October 2018. Retrieved 2 February 2019. ^ Coates, Colin MacMillan (2006). Majesty in Canada: essays on the role of royalty. Toronto: Dundurn Press Ltd. p. 11. ISBN 978-1-55002-586-6. ^ Bousfield, Arthur; Toffoli, Gary (1989). Royal Spring: The Royal Tour of 1939 and the Queen Mother in Canada. Toronto: Dundurn Press. p. 5. ISBN 1-55002-065-X. ^ a b c Paperny, Anna Mehler (26 June 2011). "Behind the royal tour, a businesslike Usher of the Black Rod". The Globe and Mail. Retrieved 11 November 2015. ^ Bousfuield & Toffoli 2010, p. 24. ^ a b c d Bousfuield & Toffoli 2010, p. 26. ^ a b c d e Department of Canadian Heritage. "Ceremonial and Canadian Symbols Promotion > The Canadian Monarchy > The Royal Presence in Canada > A Historical Overview". Queen's Printer for Canada. Archived from the original on 4 July 2007. Retrieved 14 July 2008. ^ a b c Bousfuield & Toffoli 2010, p. 27. ^ Fraser, John (2012). "2". The Secret of the Crown: Canada's Affair with Royalty. House of Anansi. ISBN 1-7708-9055-6. ^ Bousfuield & Toffoli 2010, p. 28. ^ Tidridge, Nathan (2013). Prince Edward, Duke of Kent: Father of the Canadian Crown. Dundurn Press. p. 56. ISBN 1-4597-0790-7. ^ a b Bousfuield & Toffoli 2010, p. 30. ^ Bousfuield & Toffoli 2010, p. 32. ^ a b Bousfuield & Toffoli 2010, p. 33. ^ Tidridge, Nathan (2013). Prince Edward, Duke of Kent: Father of the Canadian Crown. Dundurn Press. p. 90. ISBN 1-4597-0790-7. ^ Tidridge, Nathan (2013). Prince Edward, Duke of Kent: Father of the Canadian Crown. Dundurn. ISBN 1-4597-0791-5. ^ a b c Bousfuield & Toffoli 2010, p. 36. ^ a b Bousfuield & Toffoli 2010, p. 37. ^ a b Bousfuield & Toffoli 2010, p. 39. ^ Bousfuield & Toffoli 2010, p. 41. ^ a b c Bousfuield & Toffoli 2010, p. 42. ^ a b c Bousfuield & Toffoli 2010, p. 44. ^ Bousfuield & Toffoli 2010, p. 45. ^ a b c Bousfuield & Toffoli 2010, p. 46. ^ Campbell, Duncan (1875). History of Prince Edward Island. Charlottetown: Bremner Brothers. pp. 128–130. Retrieved 11 July 2009. ^ a b c Bousfuield & Toffoli 2010, p. 47. ^ Bousfuield & Toffoli 2010, p. 49. ^ Bousfuield & Toffoli 2010, p. 50. ^ Bousfuield & Toffoli 2010, p. 51. ^ Bousfuield & Toffoli 2010, p. 52. ^ a b c d Bousfuield & Toffoli 2010, p. 53. ^ Ontario Tourism Marketing Partnership. "Things to Do > Natural Wonders > Did You Know?". Queen's Printer for Ontario. Retrieved 2 July 2009. ^ Bousfuield & Toffoli 2010, p. 54. ^ Toffoli, Gary (10 August 1998). "CBC's Attack on Canadian Heritage". Monarchy Canada. Toronto: Monarchist League of Canada. Archived from the original on 15 February 2008. Retrieved 2 July 2009. ^ Morden, James Cochenaur (1932). Historic Niagara Falls. Niagara Falls: Lindsay Press. p. 87. ^ a b c d Bousfuield & Toffoli 2010, p. 55. ^ Winks, Robin W. (1998). Civil War Years: Canada and the United States. McGill-Queen's Press. p. 55. ISBN 0-7735-6763-1. ^ Bousfuield & Toffoli 2010, p. 80–81. ^ a b c Bousfuield & Toffoli 2010, p. 83. ^ a b Bousfuield & Toffoli 2010, p. 81. ^ Bousfuield & Toffoli 2010, p. 82. ^ a b Churcher, Colin. "Colin Churcher's Railway Pages > Royal Trains and Royal Occasions". Colin Churcher. Archived from the original on 17 February 2006. Retrieved 12 July 2009. ^ a b c Bousfuield & Toffoli 2010, p. 57. ^ Bousfuield & Toffoli 2010, p. 58. ^ Bousfuield & Toffoli 2010, p. 59. ^ a b c Bousfuield & Toffoli 2010, p. 60. ^ Bousfuield & Toffoli 2010, p. 61. ^ a b Bousfuield & Toffoli 2010, p. 66. ^ a b c d Bousfuield & Toffoli 2010, p. 62. ^ a b c d e f g h i j Archer, John H. (1996). "Regina: A Royal City". Monarchy Canada Magazine. Toronto: Monarchist League of Canada. Spring 1996. Archived from the original on 9 February 2008. Retrieved 30 June 2009. ^ Bousfuield & Toffoli 2010, p. 63. ^ a b Bousfuield & Toffoli 2010, p. 64. ^ a b c d Bousfuield & Toffoli 2010, p. 65. ^ Lennox, Doug (2013). Now You Know — Heroes, Villains, and Visionaries. Dundurn. ISBN 1-4597-2477-1. ^ King, Greg (2007). Twilight of Splendor: The Court of Queen Victoria During Her Diamond Jubilee Year. John Wiley & Sons. p. 58. ISBN 0-4700-4439-X. ^ a b c Bousfuield & Toffoli 2010, p. 69. ^ Bousfuield & Toffoli 2010, p. 70. ^ a b Bousfuield & Toffoli 2010, p. 75. ^ Bousfuield & Toffoli 2010, p. 71. ^ Bousfuield & Toffoli 2010, p. 74. ^ Bousfuield & Toffoli 2010, p. 73–74. ^ Nicolson, Harold (1959). "Ophir itinerary". King George V: His Life and Reign. NY: Doubleday. p. 68. ^ Bousfuield & Toffoli 2010, p. 76. ^ a b c d Bousfuield & Toffoli 2010, p. 88. ^ a b c Bousfuield & Toffoli 2010, p. 85. ^ Bousfuield & Toffoli 2010, p. 85–86. ^ Jackson, Michael D. (1990). "Royal Visits". In Cottrell, Michael (ed.). The Encyclopedia of Saskatchewan. Regina: Canadian Plains Research Centre. Retrieved 30 June 2009. ^ "Departments > City Clerk's Office > City Archives > Image Galleries > A View From Above > Downtown III: Spadina Crescent to the Bessborough > Note 45". City of Saskatoon. Retrieved 30 June 2009. ^ a b Davis, Chuck. "History of Metropolitan Vancouver > 1919". Chuck Davis. Retrieved 24 June 2009. ^ a b Bousfuield & Toffoli 2010, p. 86. ^ Bousfuield & Toffoli 2010, p. 107. ^ Bousfuield & Toffoli 2010, p. 89. ^ Bousfuield & Toffoli 2010, p. 90. ^ Bousfuield & Toffoli 2010, p. 91. ^ a b c Bousfuield & Toffoli 2010, p. 93. ^ Bousfuield & Toffoli 2010, p. 97. ^ Whalen, James (1998). "Royalty on the Nipigon". The Archivist. Ottawa: Queen's Printer for Canada (117). Archived from the original on 17 February 2007. Retrieved 3 July 2009. ^ a b c Bousfuield & Toffoli 2010, p. 104. ^ a b British Columbia Archives. "The Legacy". Queen's Printer for British Columbia. Archived from the original on 28 February 2009. Retrieved 25 June 2009. ^ Bousfuield & Toffoli 2010, p. 98. ^ Filey, Mike (5 August 2007). "Union Station turns 80". Toronto Sun. Archived from the original on 30 September 2007. Retrieved 6 August 2007. ^ "Ovation Given by Montreal". Montreal Gazette. 19 July 1938. p. 12. Retrieved 28 December 2018 – via Google News. ^ "CBC: Royal Visits to Canada". Canada: CBC. Retrieved 18 September 2010. ^ a b Coucill, Irma (2005). Canada's Prime Ministers, Governors General and Fathers of Confederation. Pembrooke Publisher Limited. p. 84. ISBN 1-5513-8185-0. ^ Aronson, Theo (1981). Princess Alice, Countess of Athlone. London: Cassell. p. 211. ISBN 978-0304307579. ^ "DEATH OF DUKE OF CONNAUGHT IN CANADA". The Argus (Melbourne) (30, 162). Victoria, Australia. 28 April 1943. p. 3. Retrieved 17 April 2018 – via National Library of Australia. ^ a b c d British Columbia Archives. "Chronology of Principal Royal Visits to British Columbia". Queen's Printer for British Columbia. Archived from the original on 28 February 2009. Retrieved 25 June 2009. ^ a b c d e f g h i j k l m n o p q r s t u v w x "Past Royal Tours". Government of Canada. 24 October 2018. Retrieved 22 January 2019. ^ Provincial Archives of New Brunswick (2009). "Exhibits and Education Tools > Royal Visits to New Brunswick > The Golden Jubilee: A New Brunswick Tribute > 1951 > Welcome to New Brunswick > November 6, 1951". Queen's Printer for New Brunswick. Retrieved 9 July 2009. ^ Callwood, June (December 1957). "June Callwood's Story of the Queen's Visit". Maclean's. Toronto: Maclean-Hunter. 70: 16. ISSN 0024-9262. ^ "Department of Canadian Heritage: Test your royal skills". Pch.gc.ca. 9 January 2009. Retrieved 18 September 2010. ^ Buckner, Phillip (2005). "The Last Great Royal Tour: Queen Elizabeth's 1959 Tour to Canada". In Buckner, Phillip (ed.). Canada and the End of Empire. Vancouver: UBC Press. p. 76. ISBN 978-0-7748-0915-3. Retrieved 24 October 2009. ^ "Confederation Centre of the Arts". The Canadian Encyclopedia. 2010. ^ Blatchford, Andy (2 July 2011). "Quebec and the royals: A rocky history risks another bump". The Globe and Mail. Retrieved 21 October 2018. ^ Government of Alberta. "Premier Ralph Klein > Royal Visit > Past Visits". Alberta Queen's Printer. Archived from the original on 22 April 2009. Retrieved 28 June 2009. ^ a b c Davison, Janet (26 April 2013). "Prince Philip's love affair with Canada". CBCNews.ca. Canadian Broadcasting Corporation. Retrieved 8 January 2018. ^ a b Office of the Lieutenant Governor of Manitoba. "History > Government House > The Royal Bedroom". Queen's Printer for Manitoba. Archived from the original on 13 February 2009. Retrieved 2 July 2009. ^ "On This Day > June 24, 1983 > Charles and Diana charm Newfoundlanders". CBC. 23 June 1983. Retrieved 12 July 2009. ^ "Chronology of Principal Royal Visits to British Columbia". Archived from the original on 28 February 2009. Retrieved 10 August 2014. ^ Niagara Parks. "Niagara Falls & Great Gorge > More Niagara Falls and Great Gorge > Falls Facts > Famous Visitors". Queen's Printer for Ontario. Archived from the original on 4 September 2012. Retrieved 4 July 2009. ^ "Royal Visits to Canada". CBC News. Archived from the original on 6 November 2012. Retrieved 28 December 2018. ^ "Early Life & Education". The Duke of York. Retrieved 14 March 2018. ^ Government of Alberta. "Alberta Centennial Home > Official Events > Celebrate Alberta Kick-Off Party". Alberta Queen's Printer. Retrieved 28 June 2009. ^ Government of Alberta. "Education Home > Centennial Projects > Alberta students encouraged to join the festivities the Royal Visit 2005". Alberta Queen's Printer. Retrieved 28 June 2009. ^ "Royal couple touches down in Saskatchewan". CTV. 18 May 2005. Archived from the original on 1 October 2005. Retrieved 30 June 2009. ^ "The Royal Visit of 2010". CBC. 25 June 2010. Retrieved 17 March 2017. ^ "Prince Charles, Camilla to visit for Canada 150 celebration". Toronto Star. 18 April 2017. Retrieved 20 May 2017. ^ "2011 Royal Tour of Canada by Their Royal Highnesses The Duke and Duchess of Cambridge". Government of Canada. 4 August 2017. Retrieved 23 January 2019. ^ Yelaja, Prithi (21 June 2011). "William and Kate's royal tour itinerary released". CBC. Retrieved 2 July 2011. ^ "The 2016 Royal Tour of The Duke and Duchess of Cambridge". Government of Canada. 24 October 2018. Retrieved 23 January 2019. ^ "Princess Anne's royal visit commemorated in new Barrie park". simcoe.com. 22 October 2013. Retrieved 28 December 2018. ^ "Princess Anne's Ottawa tour will honour 'everyday heroes'". CBC News. 7 November 2014. Retrieved 28 December 2018. ^ "HRH The Earl of Wessex unveils provincial plaque celebrating the Toronto-Dominion Centre". Ontario Heritage Trust. 14 August 2006. Archived from the original on 27 September 2011. Retrieved 15 September 2007. ^ "Their Royal Highnesses The Earl and Countess of Wessex to Visit the Province" (Press release). Queen's Printer for Prince Edward Island. 4 May 2000. Retrieved 11 July 2009. ^ Burke, Scott; Aimers, John (2001). "Wessexs' Tour a Triumph". Canadian Monarchist News. Toronto: Monarchist League of Canada. Archived from the original on 8 July 2009. Retrieved 11 July 2009. ^ Stepaniuk, Violette (2 July 2009). New museum in Calgary tells story of Canada’s Air Force. Skytech Dynamics Corporation. Retrieved 3 July 2009. ^ Roberts, Stephen (2003). "HRH Duke of York visits the Monarchist League" (PDF). Canadian Monarchist News. Toronto: Monarchist League of Canada. 7 (4): 4. Archived from the original (PDF) on 6 October 2007. Retrieved 4 July 2009. ^ Loriggio, Paolo (25 September 2017). "Prince Harry, Meghan Markle make first public appearance together at Invictus Games". The Toronto Star. Torstar Corporation. Retrieved 23 January 2019. ^ Jones, Alexandra (27 November 2017). "How Meghan Markle and Prince Harry fell in love in Toronto: The timeline of a royal romance". The Toronto Star. Torstar Corporation. Retrieved 23 January 2019. Bousfield, Arthur; Toffoli, Garry (1989). Royal Spring: The Royal Tour of 1939 and the Queen Mother in Canada. Toronto: Dundurn Press. ISBN 1-55002-065-X. Bousfuield, Arthur; Toffoli, Garry (2010). Royal Tours 1786-2010: Home to Canada. Dundurn Press. ISBN 1-4597-1165-3. Cartwright, Thelma; Clay, John; Hall, Edna (1977). The Silver Jubilee: Royal Visit to Canada. Ottawa: Deneau & Greenburg. ISBN 0-88879-002-3. Fleming, Rae (2002). The Royal Tour of Canada: The 1939 Visit of King George VI and Queen Elizabeth. Lynx Images. ISBN 1-894073-37-1. Lanctot, Gustave (1964). The Royal Tour of King George VI and Queen Elizabeth in Canada and the United States of America 1939. Toronto: E.P. Taylor Foundation. MacDonnell, Tom (1989). Daylight Upon Magic: The Royal Tour of Canada, 1939. Toronto: Macmillan. ISBN 0-7715-9229-9. Radforth, Ian (2005). Royal Spectacle: The 1860 Visit of the Prince of Wales to Canada and the United States. Toronto: University of Toronto Press. ISBN 0-8020-8699-3. Wikimedia Commons has media related to Royal tours of Canada. This page was last edited on 2 March 2019, at 12:24 (UTC).